The term Quantum Physics strikes fear into non-scientist major when required to take a Physics course - but its really not that bad. The following images are from the Particle Adventure website, but also available through the Stanford site. This theory of fundamental particles is called The Standard Model. In addition, every particle has a corresponding anti-particle. This may sound totally science-fiction, but the premise is really quite simple. Particles have a particular spin, and its corresponding anti-particle will have the opposite spin - nothing more. 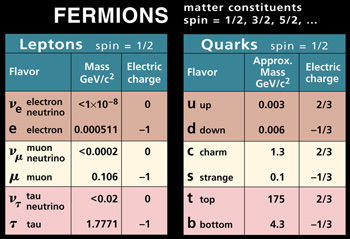 The image above demonstrates the fundamental particles that fall under the category Fermions. The name Fermion comes from Enrico Fermi. The Fermions category obeys the Pauli Exclusion Principle which states no two fundamental particles can occupy the same quantum state. This means that two "up quarks" cannot be in the same space. Bosons on the other hand can occupy the same quantum state with one another. 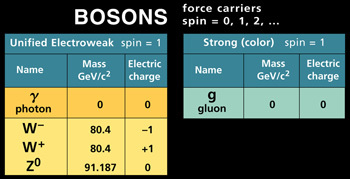 While not particles per se, Bosons are force carriers - they carry energy , like the photon. The Strong force is what keeps the atomic nucleus together. The weak and electromagnetic force together for the "electroweak" force. As far as Gravity, the theory is that the particle involved with this is called the Graviton, but this particle has yet to be seen. The above image of the atomic structure should help put this in perspective. 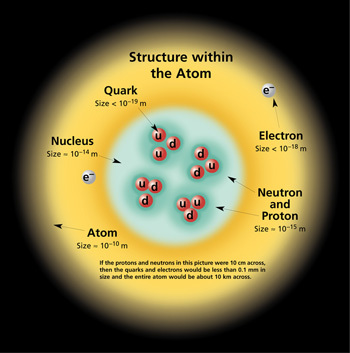 The nucleus of this particular atom contains two protons (2 up quarks and 1 down quark) and two neutrons (2 down quarks and 1 up quark). These would be held together by the Strong force. The electron is already a fundamental particle. There are other fundamental particles, but I will leave that up to you. This information here is enough to introduce the premise of Quantum Physics. 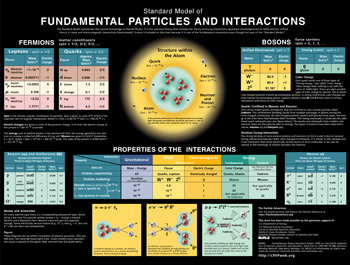 The image above shows the complete poster of fundamental particles.